MADRID, Spain, May 12, 2011 (ENS) – Two shallow earthquakes of 4.4 and 5.1 magnitude rattled the town of Lorca in southern Spain on Wednesday afternoon, leaving eight people dead, including two pregnant women. 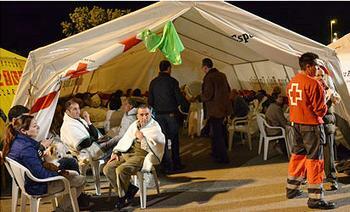 Some 400 others were injured and up to 30,000 people spent Wednesday night sleeping outdoors for fear of aftershocks. The second quake, which lasted for just four seconds at 6:47 pm local time, was the strongest quake to hit Spain in the past 50 years and was centered just one kilometer (.6 miles) beneath the surface, according to the U.S. Geological Survey. 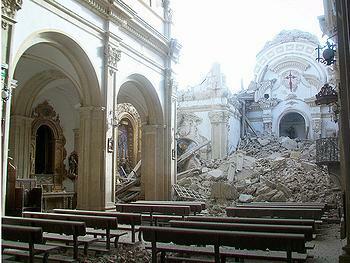 Spain’s National Geographical Institute recorded 29 aftershocks with the strongest reaching 4.0 magnitude. 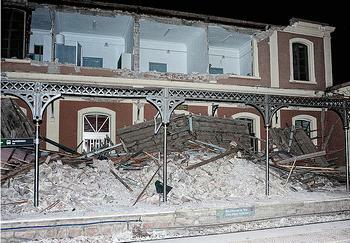 The quakes occurred in the popular tourist region of Murcia, damaging historic churches and public buildings, and forcing the evacuation of the Lorca hospital. The shaking was felt in towns up to 60 kilometers away. The epicenter of the quake is 352 kilometers (218 miles) south of the capital Madrid, where Spanish Prime Minister Jose Zapatero promised full reconstruction of the damaged town. At the Congress of the Deputies this morning Zapatero urged the public to be “calm” and sent condolences from the government to the relatives of the eight people killed in the quakes. In view of the “very serious impact” the quakes have had on infrastructure, houses and the historical patrimony of Lorca, Zapatero said he will visit the stricken town on Friday after he presides over a meeting of the Cabinet that is expected to approve the first aid and reconstruction measures. “We are not going to haggle over any economic means for the task of the reconstruction of the city of Lorca,” Zapatero promised. The Prime Minister ordered 800 military and civil guard personnel to the town, who have erected 370 army tents and a camp hospital. 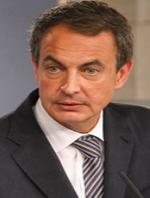 Zapatero explained that the first reconstruction tasks will be to rebuild essential infrastructures, beginning with toilets, water distribution, and public roadways. Engineers are assessing structural damage to the houses “building to building,” he said. The Spanish Red Cross has deployed some 250 staff and volunteers to the town, along with 24 ambulances, three field hospitals and two coordination centers. Since Wednesday afternoon, the Red Cross has been distributing 10,000 blankets, 2,000 beds, maternal and child health kits, water and food to alleviate the most pressing needs. “The direct and indirect victims need shelter, food and water but also, more than ever, psychosocial support to get over the emotional impact,” said Jose Ramon Delgado, a volunteer with the local Spanish Red Cross Psychological Support Emergency Team. Spain’s politicians have agreed to suspend all of Thursday’s events in the regional and local election campaign, ahead of the May 22 elections. Spain experiences about 2,500 earth movements a year, although on average only two a month are strong enough to be felt. The earthquakes that have rocked the town of Lorca “are related to the activity of the Alhama de Murcia fault,” said Juan Jimenez, a professor of geology at the University of Jaen, who heads a seismic research project in the university’s Department of Geology. The fracture is in a great system of strike-slip faults active direction to northeast-southwest, stretching from Almeria to Alicante, the area known as the Trans-Alboran shear, he said. The system causes the southeast segment of the Iberian Peninsula to move progressively toward the northeast. Jimenez explains that the recent seismicity of the region is characterized by events of moderate or low magnitude like those that occurred Wednesday. 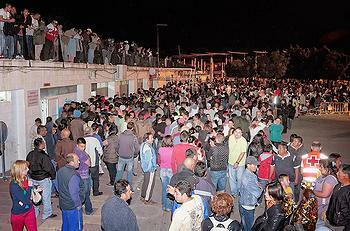 “The shallowness of the earthquake has increased the level of destruction,” said Jimenez.